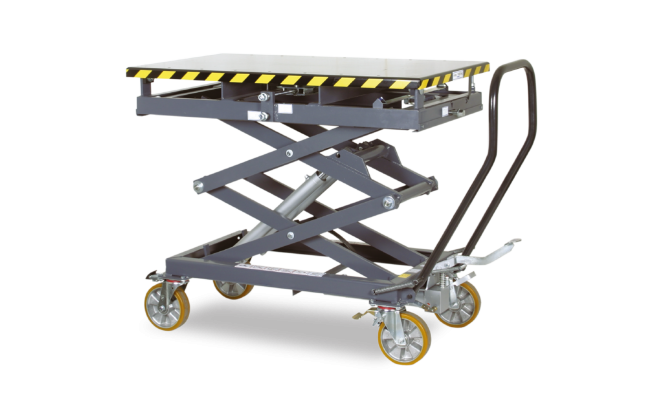 The aggregate lifting table can be used universally, thus making it excellent for safely removing and installing engines, gearboxes, HV batteries and chassis components from a wide range of manufacturers – simply the best and most comfortable workshop assistant. • VARIODESK The supporting platform surface is not only extensive but also offers diverse adjustment possibilities due to a fl exibility of ± 20 mm in xand y-axle and a tilting angle of ± 2°. 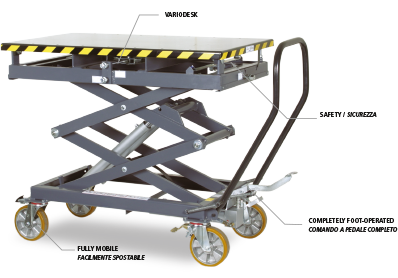 • SAFETY The generous base of the lifting platform ensures high stability and therefore enables safe and exact work. • COMPLETELY FOOT-OPERATED The integrated descent brake valve allows an exact control of the lowering speed. The load stroke is foot-hydraulic. • FULLY MOBILE Generously sized rollers – 2 fixed, 2 swivelling with integrated locking brakes – provide mobility at work.